After I was widowed, I became part of a group of men and women who had each also suffered the loss of a spouse. We often got together and discussed our mutual struggles, from financial issues to decisions about when it was the right time to do certain things. What to do about wedding rings and when to do something with our spouses’ worldly possessions were topics that came up very often. And the one thing I discovered was that both of these concerns should be handled in a very individual way. I think it comes down to what you are comfortable with. One friend took her wedding ring off the day of her husband’s funeral and gave it to her daughter. Another still wears her ring on her left hand twelve years after her husband’s death. For me, it was a spontaneous decision. One day almost a year after my husband’s death, I felt compelled to simply move my ring from my left hand to my right hand. My sister-in-law had her wedding ring restyled as a dinner ring, but still wears it on her left hand. I know several other women who had the diamonds removed from their rings and made into necklaces or pins. Widows and widowers wrestle with the problem about what to do with their spouse’s worldly possessions. In my opinion, there is no time schedule or rule book about how to do this, either. Some people are forced into disposing of their loved ones possessions because a home has to be vacated quickly. That is what happened to me. I sold my house and even though my husband had died a year earlier, I still had not done anything with his clothes and personal items like fishing equipment. For me, I found it comforting to give away things like his favorite rod and reel to one of his fishing buddies. Certain family members wanted something to remember him by, and filling those requests also helped me. I did realize that I needed to keep a few articles of his clothing. Not much—just a favorite pair of jeans and a shirt or two. They are hanging in the back of my closet and probably always will be. It brings back good memories when I look at those items. But the bulk of his clothing I gave to a charity. To me it was easier to be forced into making a decision about my husband’s clothes. It seemed to be less painful that way. But many people simply have to decide when and if they want to get rid of the clothing and personal items. What worked for me might not work for someone else. So it is important to remember that no one else can tell you what to do or when to do it. Well meaning friends and family members need to be ignored if they try to tell you when and how to deal with these issues. If you allow a family member to pressure you into cleaning out a closet right after a loss, for example, you might regret it later. Perhaps the best way to approach it is to make decisions concerning wedding rings and worldly things based on what might ease your grief a little, or help you move on towards recovery. If you feel you cannot have closure until you get everything out of the house or put your wedding ring away, do it. But if it makes you feel more comfortable—even years later—to continue to wear your ring and leave your spouse’s closet untouched, that is what you need to do. There are many factors involved too—like age, the type of loss, how long you were married, the nature of your relationship and so on. For example, if your spouse had been ill a long time, you might feel more comfortable giving his clothes to your favorite charity immediately after his death. Or if you are elderly and still living in the home you shared with your spouse for over fifty years, then you might feel better leaving things just as they are. And you may want your wedding ring to remain on your left hand. I remember my grandmother, who outlived my grandfather by thirteen years, wanted to be buried wearing the wedding band that had been lovingly placed on her hand five decades before. 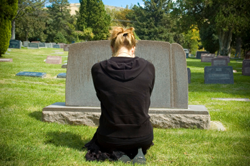 Everything about losing a spouse is complicated and that is why each decision requires careful thought. Then you can make a decision based on your individual needs and situation. So when these issues come up, remember to listen to your own heart and do whatever you think is best on your own time schedule.